Yesterday Github released their long awaited git client for Windows and of course – it is quite awesome. But that is not why I am writing this blog post. I felt that the time has come for me to reveal a little more about the side project I have been working on for the past ten months. 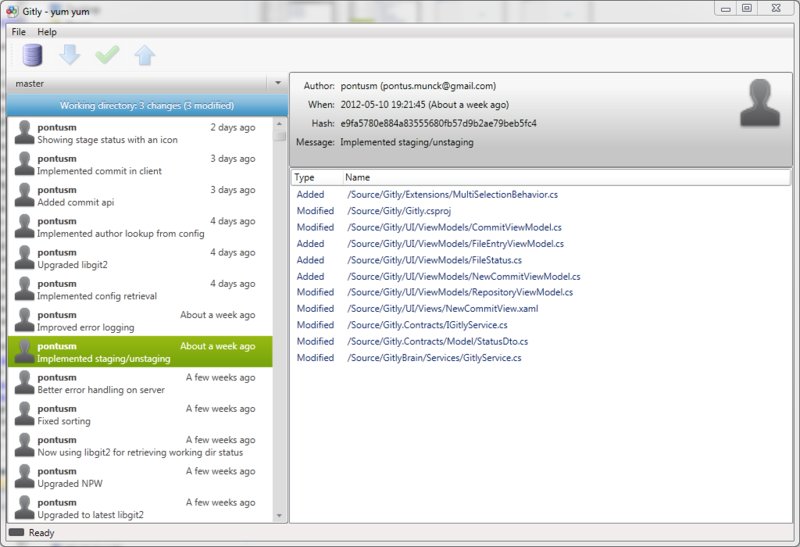 You have probably guessed it by now… Yes, I have been working on a Git client for Windows and it is called Gitly. Now, why the heck do I want to write my own Git client? Especially now when Github is finally sprinkling their fairy dust on the Windows platform? Well, the plans for writing my own client started over a year ago and my primary motivation was that I believed I could do something better than the mixture of tools that was available back then. So in August 2011 I started hacking away on what I believed would be a project I could complete in a few months. Hmm, didn’t turn out that way. Instead it was a pretty rocky road I had to overcome before I finally had the basic things working. However, I learned a great deal about Git on the way and I still think I can make something that people will find useful. Today I have released the first version of Gitly to a number of private testers. The application is far from finished and I can’t promise when it will be ready, but I’m quite happy I’ve reached a point where it is actually usable. I’m pretty convinced I will keep working on it as a hobby for the better part of this summer and release new versions frequently. The main purpose of Gitly is to provide an easy way to introduce Git in your organization where people may be used to traditional version control systems and don’t want to learn to use Git command line stuff. That means you need a user friendly and easily accessible UI, integration with Visual Studio and simple intuitive workflows. All provided in a single easy installation. That is what I aim to provide with Gitly. I feel strongly about Git and I want to give developers a good alternative to TFS and SVN. I’m hoping that Gitly will provide that. What do you think? 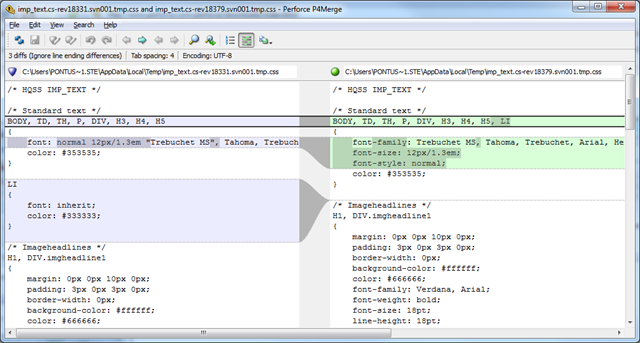 Here’s a little tip for those of you looking for a good diff/merge tool. It works quite well with both TortoiseSVN and Git Extensions and I’m sure it works with other applications as well. 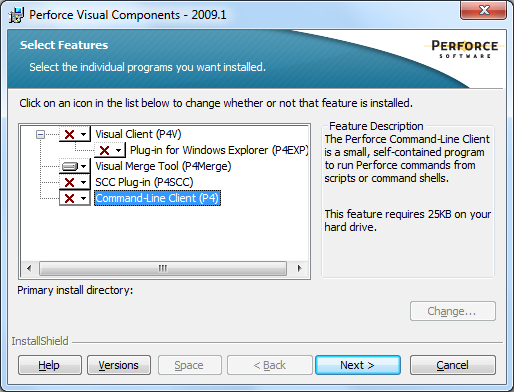 Some of you may have heard of Perforce. It’s a pretty expensive source control system that is used by Google among others. I have never used it myself but I guess it’s ok. What I do know is that they have a great tool called P4Merge for merging and checking file differences. Best of all is that you can use it for free! 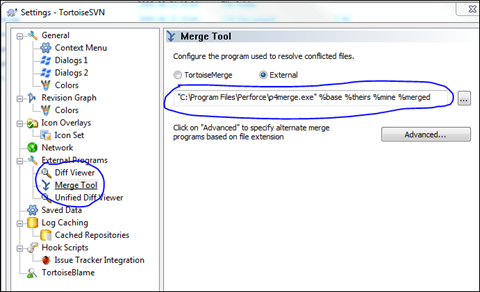 To use P4Merge you need to install the Perforce Visual Client which is available as a free download from the Perforce download page. Make sure you get the right version for your system. It’s pretty easy to configure Git Extensions to use P4Merge. 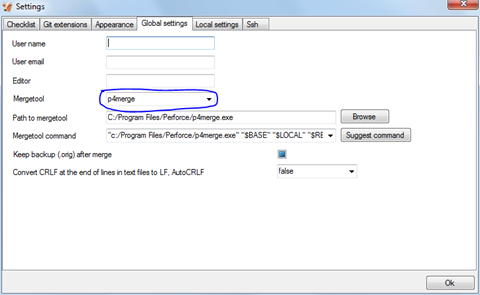 All you have to do is to open up the settings and choose “p4merge” in the Mergetool dropdown. The correct paths should be filled in automatically for you. That’s it – now you can enjoy a pretty nice tool for free!